Toll Free Question Hotline 1-800-309-5190. Sales hours: Monday – Friday 8:30a.m. to 4:30p.m. Central Standard Time. These are the best boat covers available. They are suitable for storage/mooring as well as trailering. The cover is made from marine grade polyester. The cover is made from 7.8 oz/600d/600 denier solution dyed polyester. 600d is an indirect measurement of density and weight. The higher the number, the heavier, thicker, and heavier duty. This is the thickest cover you will find. You will see a lot of 300d, even 150d covers, which are proportionally half as thick and 1/4 as thick as our covers. The fabric is then coated twice with polyurethane on the bottom or downside, UV protected, and mildew protected. 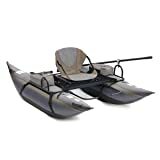 Fast 8′ boat and oars disassemble into a compact size for easy transport and storage. Extra tall seat back provides additional support, and footrests adjust to a variety of leg lengths. Rides high for improved visibility. 350 lb capacity. Harbor Mate telescoping boat cover support pole is designed to prop up a boat cover during off-season storage to reduce water and debris buildup, making it much easier to remove the cover when boating season returns. Each cover pole adjusts from 28″ to 48″ high and twists to lock. Be sure to unlock the bars by twisting in opposite directions to allow telescoping and then back to secure in place. For added cover tension support, a 4.875″D mushroom shaped cap is included, which snaps directly to the cover support pole once the snap screw attachment is removed. The foot includes a rubber cap designed not to scratch the boat hull during storage. Made with Light-weight, durable aluminum construction built to last. ****NOTICE****If your boat has new white vinyl seats, we do not recommend Burgundy. The chemical in new white vinyl seats will cause a reaction that will draw the color from burgundy solution dyed material. The reaction is much less common with older seasoned upholstery, even white. Unzip this attractive golf seat blanket and you will have instant protection from cold, damp or dirty golf car seats. The reversible quilted design features a water resistant fabric on one side and a soft, plush fleece fabric on the other. This golf seat blanket quickly secures to the golf car seat over the armrests and can be used as a seat cover or as a lap blanket to keep your legs warm. 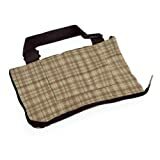 This golf seat blanket easily and conveniently folds up into its own case for easy transport to and from your car. One year limited warranty. 14-16 ft. Hunting Boat Cover up to 91″ Beam – Waterproof 65% Polyester, 35% Cotton fabric. Designed for modified V-Hull boat shapes. Fits 14′ to 16′ long boats (91″ max. beam width) . Includes trailer tie-down straps with loop-ends and front trailering strap. Great for aluminum boats, fishing boats, hunting boats, and more!. Please note: For the best performance of any boat cover, it is highly recommended to use a boat cover pole support system, o prevent water from pooling on the surface. These support poles are not included. Product is a boat cover only. Tie down kit consists of twelve 1″ x 8′ (2.54cm x 2.44m) black polypropylene straps with quick release buckles. The DuraShield 25-foot to 28-foot Pontoon Boat Cover is a durable, weatherproof, premium marine cover made of heavy duty 600 denier marine grade polyester. This cover features a breathable, water resistant, mildew resistant, and UV coated material that keeps your boat dry and out of harmful UV rays. We include 4 under straps and 4 over straps with click-fit ends to secure your cover on the road or for indoor or outdoor storage. A color-matched storage bag is provided with this cover. **Under-cover supports/bridges not included. Additional straps may be needed for trailer use, depending on application. 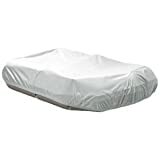 Taylor Made Products trailerable T-Top Console cover is secured to the underside of the fixed T-Top structure and will enclose any size console, helm seat and T-Top support combination with a maxium base perimeter of 18′ or less. Boat, Cover, Dallas, Inflatable, Mfg. This ultra-rugged 600D polyester canvas cover works harder than any other to keep water, dirt, and debris out of your boat. Ideal for protection during trailer travel and moorage. AWWCV Features: -Color: Gray. -Made of a durable marine grade polyester blend, this cover gives years of protection, shielding out rain and debris. -The elastic cord gives a snug, tight fit. -Dimensions: 12” H x 65” W x 93” D.
Light-weight, durable polyester that is water repellant, yet highly breathable. 4-ply joined seams (no raw edges). 1/4” heavy duty shock cord sewn into hem for a snug fit. Great for storing and mooring applications. 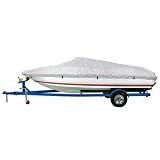 Extremely tough and durable for a highly economical boat cover. Use MAC tie-down straps for trailering.